Slow moving rivers, tributaries and floodplain lakes. A standard 24″ x 15″ x 12″ (60cm x 37.5cm x 30cm) – 70 litre tank is suitable for a small shoal. Alternatively, it also does well in a well maintained, heavily planted tank. As any of these seen for sale will almost certainly be wild caught a more general setup is not really suitable. 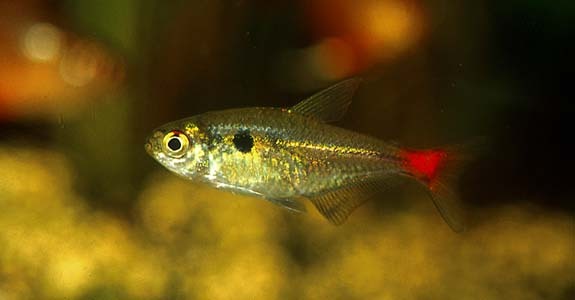 Adult males are slightly smaller and noticeably slimmer than females. Not often seen for sale, but occasionally shows up as a contaminant among imports of more popular species. It’s a subtly attractive species when in good condition.